I'm sure everyone's tired of hearing about the King Street transit-only lane, but please indulge me for two minutes. I'm quite frustrated with how this plan was implemented, and I'm not just talking about the faded paint. The paint is literally gone since last October, which gives us a great opportunity to do it right this time around when staff repaints the lanes over the next several weeks. John to Bay: paint the narrower parking/loading zone 6-7 feet from the curb, whatever a typical curb parking space is. Then, paint a 4-5 foot bike lane. Then the 9-10 foot bus lane. Bay to Locke: it's even easier along this stretch with the massive lane width on the north curb. Paint a four-foot bike lane next to the sidewalk, then the 9-10 foot bus lane. Locke to Dundurn: an extra, unnecessary fifth lane appears at Locke so it's even easier still to make room for cycling. The bike lane could be five feet if we wanted, with a wider bus lane if needed. This configuration has the same traffic flow and the same parking on south curb. But we've clearly accommodated cyclists instead of using this massively wide bus lane. It has grown tiresome to see ongoing disconnect between how we do things in Hamilton and how other cities around the world do them. they need an advanced green for the buses at James so they don't have to battle with cars when trying to merge into Macnab. Drivers supposed to yield to the bus. Some police enforcement with substantial fines would get the message across. This is the number one upgrade that needs to happen right away, as it will improve the experience for EVERYONE. I think we also need a dedicated bus signal for john street onto king in order to eliminate the mayhem happening with merging buses between hunter and king. courteous drivers let the bus in. Public transit vehicles should have signal control so that their operators can control the traffic lights. They don't stop at reds or respect the other drivers on the road, so would giving them a button to do what they do already make a difference? HSR drivers are certainly not all law abiding drivers. I have seen some terrible examples. Huh? I have never seen a bus driver in Hamilton run a red light. Has anyone else here ever seen that? Drive downtown sometime, along King or Main, especially along King at JAmes, where they're rushing to turn left or make it to the stop in front of Jackson Square. They do it a lot at John/Charlton, John/Augusta, and especially at John/TH&B. How do they do it in the Netherlands? I haven't seen you bring that up this post. I'm with you: the HSR drivers seem pretty consistently law abiding to me. Worst part is it was the city's bike plan manager who designed the bus lane! When even the cycling manager doesn't care about accommodating cyclists, we're pretty much screwed. While waiting for the upper paradise bus on the corner of King and James, even in the dead of winter, I watched cyclists go by in the bus lane very frequently. Seems like nobody is willing to ride a bike in the middle of King street. I can see that they've realized that as well. I'm just wondering what they're supposed to do after Bay ... merge into the middle of the street? Merge across all lanes into the south side? Good luck! On top of that, a slight change was made to the rules for cyclists. According to Trevor Horzelenberg, senior project manager for public transportation, bikes will now be allowed to travel straight from John to Bay streets in the north curb lane. The pilot's one-year term would appear to expire four days before the election. Coincidence? Hamilton: the city that half-asses everything it does. What's really need is pedestrian lanes seeing as electric and mechanical bicycles take to the sidewalks and come at us from all angles, usually from behind quickly. Need airbags for pedestrians also. And/or the police or by-law officers and council could put an end to the lawlessness that cyclists violate all the rules of the road everyone else is forced to live by. I've noticed Ottawa Street is really bad for sidewalk riders. There is a reason cycling on the sidewalk is illegal. It's dangerous and stupid. Maybe we could educate pedestrians and cyclist better. I have always advocated for cycling to be taught in elementary school, high school at the latest. Like swimming, it's one of those basic life skills, important to know how to do properly. Youth should leave school, already knowing the rules of the road, regardless of when or whether they go on to get their driver's license. Cycling on sidewalks is almost unknown in The Netherlands. Why? Because there are proper protected cycle lanes. Sidewalk cyclists are an indicator species for a Subjective Safety failure that shows where protected lanes are necessary. This is untrue. Cyclists drive anywhere they feel like in the netherlands. Road, sidewalk or bike lane. Yup. On some streets, cycling on the road is really not a viable alternative. The easiest way to solve this is to just abandon the bus lane. It was a bad idea from the start. I like this take on modernist Canadian poetics. Arrgh, spambots are like virulent invasive weed species trying to overrun the garden. Just remember what George Orwell said, A weed is a plant whose virtues are not yet understood. At least they used to be mostly aiming at the article backlog instead of the front page. The example you gave from Ottawa is of rather poor design, since 1) the bike lane is not protected, and 2) there is unnecessary pedestrian/cyclist conflict with loading/unloading bus passengers. Another issue is the loss of right-side parking between Bay and Queen. 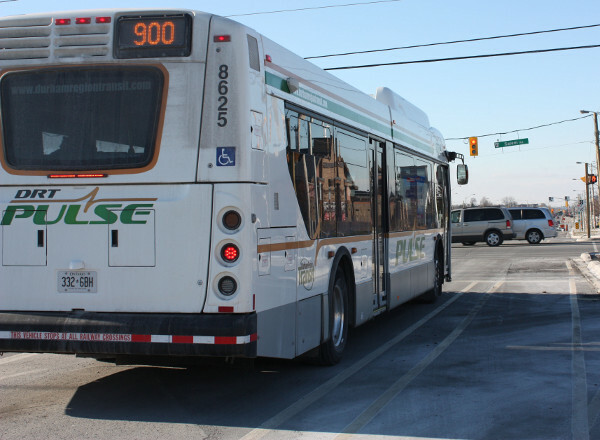 Those businesses are creating a loud voice against Hamilton's transit improvement plans in general and the bus lanes and councilor McHattie in particular. So is today's rain/snow - coming only 48 hours after the new line markings were painted - going to affect the adhesion once again? I was on the bus today and they're already looking a little thin in spots!! Why does a bus need a special lane? Keep the lights green longer and the traffic will flow out, increase the speed on King from James to Dundurn. Let's keep Hamilton moving. The bus lane needs to be painted red like every other "properly" dedicated bus lane in North America. 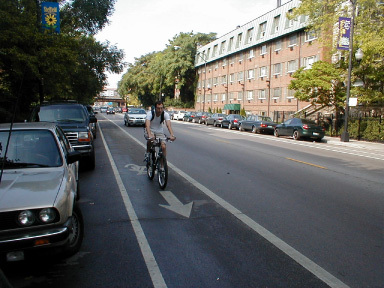 A simple google search of "dedicated bus lanes" shows many images of this.